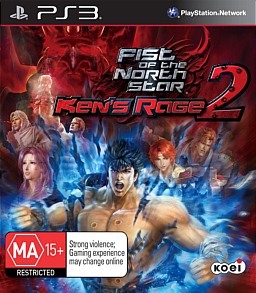 *CLOSED* Win Fist of the North Star: Ken's Rage 2 PS3 Pack! Kenshiro is the master of Hokuto Shinken, a mysterious and brutal martial art that leaves nothing but blood and gore in its wake. A faithful interpretation of Tetsuo Hara's legendary manga series, Fist of the North Star: Ken’s Rage 2 will transport you to a post-apocalyptic setting that would leave even Mad Max quaking in his boots. Thanks to our good friends at Mindscape we have a copy of Fist of the North Star: Ken's Rage 2 on PS3 AND a t-shirt depicting Ken's scarred body to give away! Modelled by a hunk o' man meat! Entries close 11:59pm on Saturday 23rd March 2013. Your details will not be used in any way other than for the delivery of your prize. Geek of Oz and Mindscape do not take any responsibility for the loss, damage or delay of/to prizes sent to winners (blame Australia Post for that one). The judges decision is final and no correspondence will be entered upon. 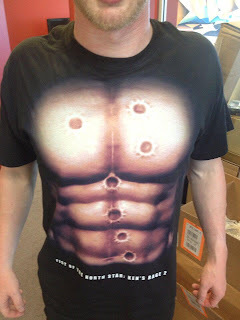 T-shirt is one size only. One entry per person. Prizes are not redeemable for cash or any other kind of trading currency such as creds, latinum, sen, kan, zeni, double dollars or Ankh Morpork dollars. This competition is only open to Australian residents. Any questions or queries can be submitted through the comment section at the bottom of screen. Good luck!